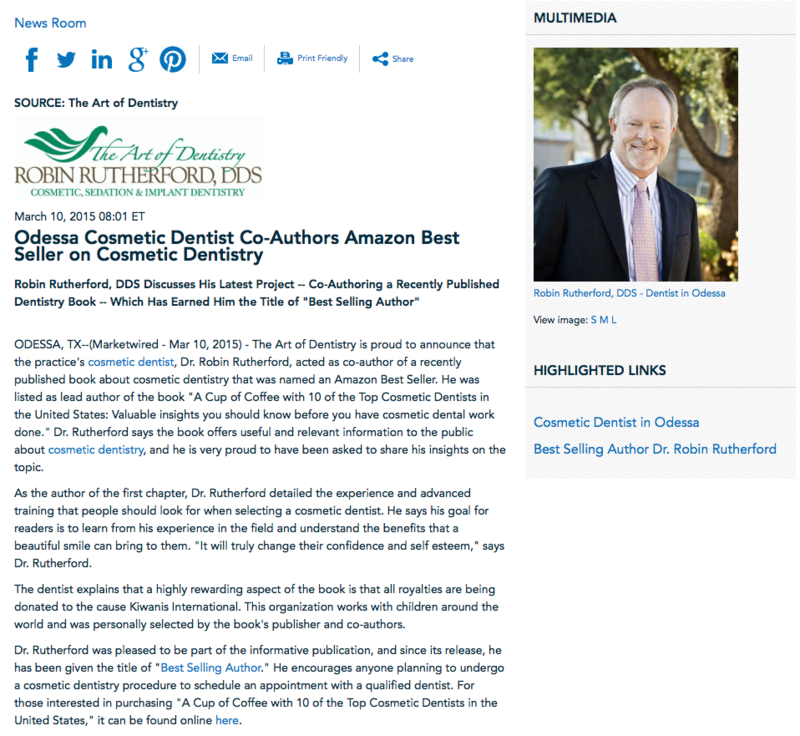 Odessa, TX – The Art of Dentistry is proud to announce that the practice’s cosmetic dentist, Dr. Robin Rutherford, acted as co-author of a recently published book about cosmetic dentistry that was named an Amazon Best Seller. He was listed as lead author of the book – “A Cup of Coffee with 10 of the Top Cosmetic Dentists in the United States: Valuable insights you should know before you have cosmetic dental work done.” Dr. Rutherford says the book offers useful and relevant information to the public about cosmetic dentistry, and he is very proud to have been asked to share his insights on the topic. As the author of the first chapter, Dr. Rutherford detailed the experience and advanced training that people should look for when selecting a cosmetic dentist. He says his goal for readers is to learn from his experience in the field and understand the benefits that a beautiful smile can bring to them. “It will truly change their confidence and self esteem,” says Dr. Rutherford. The dentist explains that a highly rewarding aspect of the book is that all royalties are being donated to the cause Kiwanis International. This organization works with children around the world and was personally selected by the book’s publisher and co-authors. Dr. Rutherford was pleased to be part of the informative publication, and since its release, he has been given the title of “Best Selling Author.” He encourages anyone planning to undergo a cosmetic dentistry procedure to schedule an appointment with a qualified dentist. For those interested in purchasing “A Cup of Coffee with 10 of the Top Cosmetic Dentists in the United States”, it can be found online here. Dr. Rutherford earned his dental degree from the University of Texas Dental School at San Antonio. He has been recognized for his excellence in dentistry by being named the “Best Dentist in Odessa” by Odessa American and one of the “Texas Super Dentists” several years in a row in Texas Monthly magazine. Dr. Rutherford is active in several medical organizations, including being a member of the American Orthodontic Society and the American Academy of Cosmetic Dentistry. He is also a Fellow of the Dental Organization for Conscious Sedation and a Diplomate of the American Dental Implant Association. Dr. Rutherford is available for interview upon request.